Ever since I can remember, I have been a candy junkie. When I was a child, my sister, brother, and I would trek down to the corner store to buy our daily fixes. My favorites back then were Giant Pixie Sticks, Necco Wafers, and black jelly beans. So what made candy so magical? It was bright, colorful, tangy, chewy or crunchy, and best of all sweet! It's no wonder that my favorite fantasy film is Willy Wonka And The Chocolate Factory. And my second favorite holiday after Christmas, is Halloween. Trick Or Treating is a favorite pastime of mine. But silly me, this activity is not so far seated in my past. For just three years ago, I dressed as Darth Vader and went Trick Or Treating with my son. We must have come home with twenty pounds of candy. I think I was more thrilled than he was. David and Alan like candy as well. But those two are much more into chocolate. Not I. I want the corn syrup based stuff. I have my favorites these days as well. Mostly I pair a type of candy with an activity that I like to engage in. Nerds are perfect for chomping on in bed while reading. Good And Plenty are great movie candies. 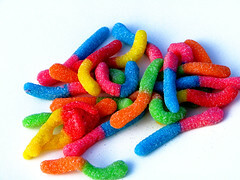 Gummy worms are perfect when one has a craving for something chewy and sweet. Lollipops are nice for driving or while computing. My dream career would be to have my own candy factory. How sweet would that be?! Today I love candy even more than I did as a child. And there really isn't a single candy type or brand that I would not indulge in. Life is sweet when one has a pocket full of these treasured treats. Kit Kat - I'd eat the sides first and then take each wafer apart. M&M's (plain only) - I'd microwave them for a few seconds so that they're melted on the inside and then I'd split them in half so I'd end up with two shallow candy cups of melted chocolate. Snickers/Mars Bar - eat the chocolate encasing first and then each ingredient separately. RUNTS- These are my Favorite! (made by Willy Wonka by the way) I have to separate them into flavor piles and eat them from least favorite to most favorite. They have Chewy Runts in the machine at work sometimes and when they do, I have a packet a day. I can't find Chewy Runts anywhere else. Hard Candy (Jolly Ranchers, generic hard candy) - Excellent for driving, working, etc. but I don't like the milky creamy types, just plain clear hard candy. ...a chat with you and somehow, death loses its sting.